Ahead of checking in to the venue for the night, AR Rahman shared a group photo with other friends in tow and wrote: "All set to go for Grammy night!" Priyanka Chopra wrote: "So proud!" Grammy-winning singer-composer AR Rahman got an invitation to the 61st edition of the Grammys in Los Angeles, which was accepted and attended on Sunday evening (which is Monday morning in India). 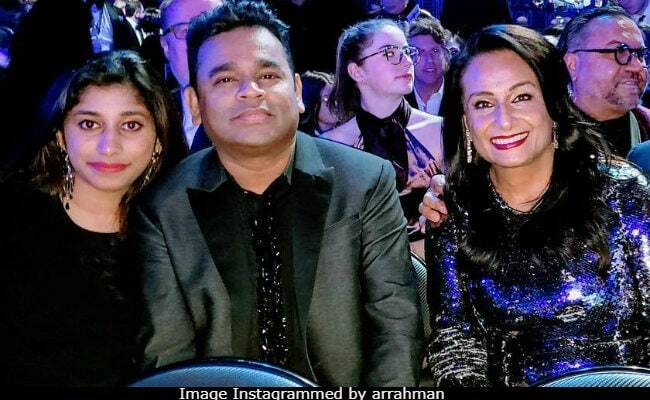 52-year-old AR Rahman shared photos from the event on his Instagram account through the length of the show. Mr Rahman took along his daughter Raheema for the Grammys, who also features in most of the entries. Ahead of checking in to the venue for the night, AR Rahman shared a group photo with other friends in tow and wrote: "All set to go for Grammy Awards night!" Priyanka Chopra was the first celebrity to congratulate AR Rahman for being part of the prestigious award show. "So proud," she wrote. Priyanka and her husband Nick Jonas recently partied with some of the Grammy nominees but did not attend the Grammy awards. Meanwhile, what followed on AR Rahman's Instagram was a series of posts with glimpses of the tribute performance for Dolly Parton, Camila Cabello's theatrical performance to Havana, Quincy Jones' record-making Grammy win and of course, Lady Gaga's A Star Is Born-special performance. In between the updates, Mr Rahman and Raheema featured in customary Grammy-special glimpses from the awards night. However, it's not just Priyanka who cheered for AR Rahman for attending the Grammys. His Instafam is also majorly impressed and posted shout outs for Mr Rahman in the comments section. "Making India proud, sir," read a comment while another added: "All prayers and good wishes!" In 2010, AR Rahman made his debut as a Grammy-winner and struck double gold with two wins in the categories Best Compilation Soundtrack for a Motion Picture (for Slumdog Millionaire) and Best Motion Picture Song (for Jai Ho). AR Rahman's Grammy wins were two more trophies added to his awards legacy, headlined by the Oscars - he won two Oscars for Slumdog Millionaire in 2009. AR Rahman's legacy of awards includes six National Awards and several Filmfare Awards from across Bollywood and the South film industry. He was honoured with the Padma Shri in 2000 and Padma Bhushan in 2010 for his contribution to Indian music and cinema. Meanwhile, Kacey Musgraves, Childish Gambino and Lady Gaga were the big winners at the 61st Grammy Awards. You can take a look at the complete list of Grammy winners here.